Chop onions into thin slices and brush lightly with olive oil. Cook onions on grill until soft – about 4-5 minutes – and set aside. Cook sausages on medium-high grill until they are just pink inside, also about 5 minutes. Place split top buns at edges of grill to toast until they are very crisp, both inside and outside, while the sausages are cooking. 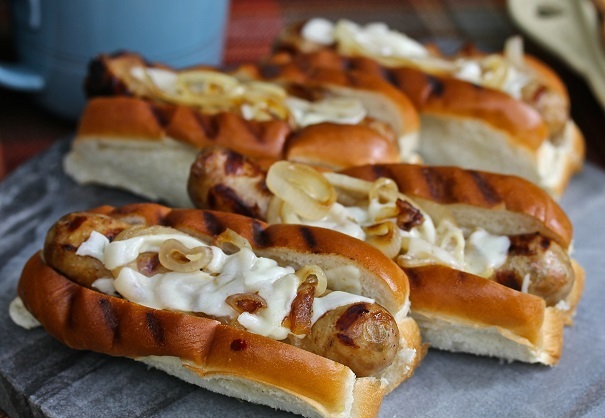 Put sausage into bun, spread onions on top of the sausage and cover with ½ slice of cheese. Put sandwiches at cooler part of grill and using a deep pot lid, cover sandwiches for a minute or two to allow cheese to melt.